This website applies geolocalization you can find more info HERE. The world’s first SportModular helmet: the performance of a full face helmet together with the comfort of a modular. Entirely built in Carbon Fiber (shell and chin), this specific structure achieves the same protection performance of MotoGP’s Pista GP R in an incredibly light weight construction, combing the highest levels of comfort and safety. Designed to offer 190° horizontal view as the human eye capability, SportModular has been conceived in the wind tunnel for superior quietness, aero stability and ventilation. 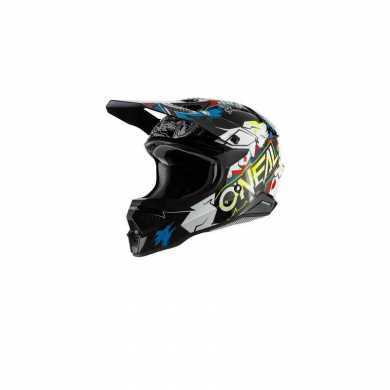 the helmet is totally made of carbon, including the chin guard: a very rare solution, we are talking about a helmet with three shell sizes and therefore three sizes of chin guard. panoramic visor that has no match on the competition: 190 ° offered by the Sport Modular, the same obtained with the PistaGP, are those that correspond to the visual field of the human eye. And peripheral vision is very important for a security issue. the visor is in optical class 1 as on the PistaGP, despite a thickness that can guarantee maximum safety, and anchored with the same mechanism that allows you to lock in all closed or micro-opening. And we have Pinlock 120 as standard. ventilation counts on a front air intake with three positions and on one placed on the chin, which divides the air flows between the face and the inner side of the visor, performing an anti-fog effect. We also find an extractor positioned on the spoiler, which being closable, however, allows the extraction of air from the ducts in the lower area, ensuring the correct air recirculation. The interiors are made of mix of Shalimar and Ritmo, refined materials that offer a synthesis of stability and smoothness to improve the contact with the skin. The cap is reversible with a warmer and cooler side, to better adapt to use in summer and winter. Naturally it is completely completely washable, and with excellent characteristics of dispersion of the sweat that is moved from the skin to the outside. EPS, hooks that fix the interior, arranged parallel to and not transversely to the surface of the skull so as not to constitute a hazard in the event of an impact. And the helmet is equipped with two sub-tuners: the standard one can be replaced with a larger one that completely seals the helmet.